Photo: Office of Los Angeles Mayor Eric Garcetti. 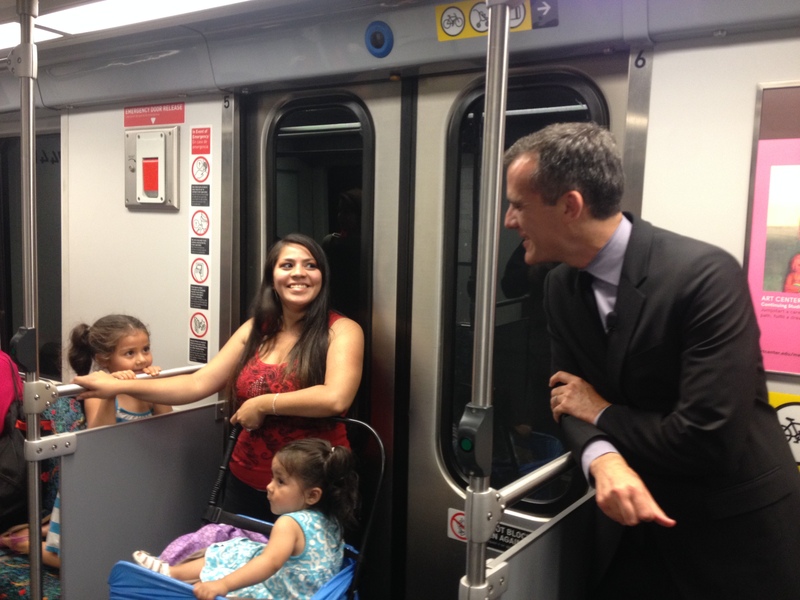 On the trip, Garcetti lamented getting “stuck in City Hall,” saying quick, unplanned encounters with people help him gauge people’s concerns and can build trust with residents, particularly in his early years as mayor. “Most people don’t want a half-hour meeting with the mayor,” he said. The mayor will also serve as the Chair of the Metro Board for the next year (the Board Members take turns). It will be interesting to see what kind of agenda he pushes at Metro — and think a good starting place is to talk to folks who ride the system and pay the bills here. Semi-related: a great way to gauge people’s concerns about Metro is to also read our general Twitter feed, including tweets from riders. The agency and Disney Hall agree to several mitigations to ensure that the Regional Connector — running 135 deep underground and adjacent the concert venue — won’t cause vibrations that could impact acoustics. Tests last year established the ambient noise in Disney Hall and Metro has agreed to limit vibrations to well under those standards. In response to criticism and doubts from state lawmakers, the California High-Speed Rail Authority wants to accelerate construction of a Burbank to Palmdale segment of the bullet train project. Such a segment could reduce travel time for trains from more than an hour to 14 to 16 minutes. That said, there remains considerable challenges. The first is finding the funding — the L.A. to Palmdale segment is estimated to cost more than $13 billion and that could rise if a more direct tunnel to the Antelope Valley is built under the San Gabriel Mountains. The segment would presumably later connect to Union Station and Bakersfield and the segment being planned between there and Madera. My three cents: I think there are plenty of reasons to remain skeptical about the ability to build a $68-billion project between San Francisco and Los Angeles with the major funding source a $10-billion voter-approved bond. That said, if funding is limited, it sure would be great to see commuter rail get a boost in populated and taxpayer-heavy Southern California, an area where commuters are already riding trains on a daily basis. Los Angeles County Supervisor Zev Yaroslavsky, who represents this portion of Los Angeles and has publicly blamed Kiewit for the project’s delays, declined to comment Tuesday. Jenna is heading up Metro’s team of planners working on the Union Station Master Plan. In this interview, she talks about the many details of the emerging plan that were released last month (Here’s a Source post about the plans). The Planning Report saved perhaps one of the juiciest questions for last, asking Jenna how the Master Plan would be funded and if there could be money available from a potential Measure R 2 sales tax. As Jenna wisely pointed out, the key word with Measure R 2 is “potential” and that it’s impossible at this time to say what will or will not be funded by it. As if often the case at Metro, projects are planned before all the funding is secured — the agency often needs to have firm plans in in order to get money to build them. Interesting interview with the UCLA professor who literally wrote the book on big cities and parking policies (a book highly critical of big cities, that is). There’s nothing fantastically new in the interview but it’s always fun to revisit the question of whether developers should be required to build parking or not (they almost always are for both residential or commercial properties). Parking is very expensive to build and maintain and folks such as Shoup believe it results in a lot of expensive, free and unnecessary parking that consumes a lot of space that could be better used for other purposes. In other words, if someone in a city wants a car badly enough, they’ll find a parking place and the money to pay for it. Agree or disagree, Angelenos? If Benaroya Hall could be built directly on top of a class I railroad tunnel, and successfully isolated from the noise, there’s no reason why a trolley subway could not be successfully isolated to keep noise out of Disney Hall. Interesting story about Disney Hall & Metro coming up with a plan to keep noise & vibration levels at a minimum. A similar situation occurred in Washington, DC where Metrorail’s Judiciary Sq. Station (Red Line) needed to use the same noise-reducing mechanisms during construction in the 70’s & 80’s. Your email and Metro Facebook link don’t work. II say, require a handicapped space and a loading zone every block, maybe some more for places which attract a lot of handicapped people or a lot of trucks, and that’s enough of a minimum parking requirement. Everyone else can figure out how to pay for storing their car if they want to. I fail to see how Shoup’s vision of transforming parking into a luxury good for only the 1% is a good idea. If we reform parking on the supply side, as Shoup suggests, the policy outcome in the short term will reduce parking supply available but the policy outcome in the medium and long term will generate a profound backlash against supply side parking restrictions: laws will be passed and regulations issued requiring much more parking than is currently required. Parking reform should focus on the demand side if it wants to be both effective, persistent over generations and supported by voters. Supply side parking reforms are doomed to failure because of their maniacal focus on only benefiting the elite and wealthy. And don’t forget that supply side parking reforms are policies that generate direct, noticeable and measurable harm on those unable to access the new parking luxury good. The supposed benefits for everyone (traffic wise) are diffuse and nearly impossible for an individual to notice, wonky villians will be able to onanisticly flash their numbers showing a social benefit, but will find it hard to get anyone to believe them because people will buy in to the everyday experience they have; that experience being the sensation of personal injury by being unable to access parking. People will believe their own personal experience everytime over believing the wonks self-fellated numbers. So it is harmful to the 99% and beneficial to the 1%. Taking away parking to socially engineer behavior into using transit is a terrible idea. Supply side parking reforms are doomed to failure, but demand side reforms have the possibility of phenomenal success.